Have you read the March issue of BITES - The Scoop of on Good Eats? 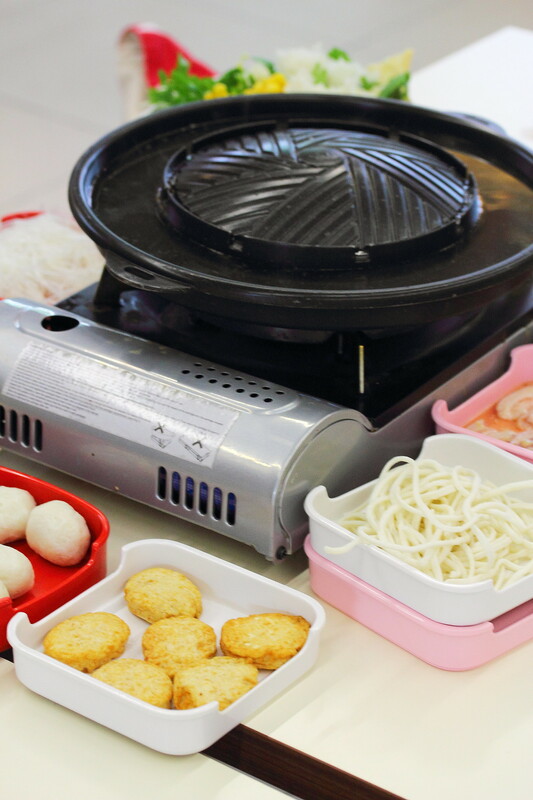 Yes, SG Food on Foot is on the blogger hot seat for the month of March, going toe-to-toe with the team at BITES for a buffet lunch at Siam Square Mookata, Jurong East. Check out my interview where I shared which is my MRT station and review on Siam Square Mookata. I was told that there is a new Mookata place in the west and it is located inside a coffeeshop. 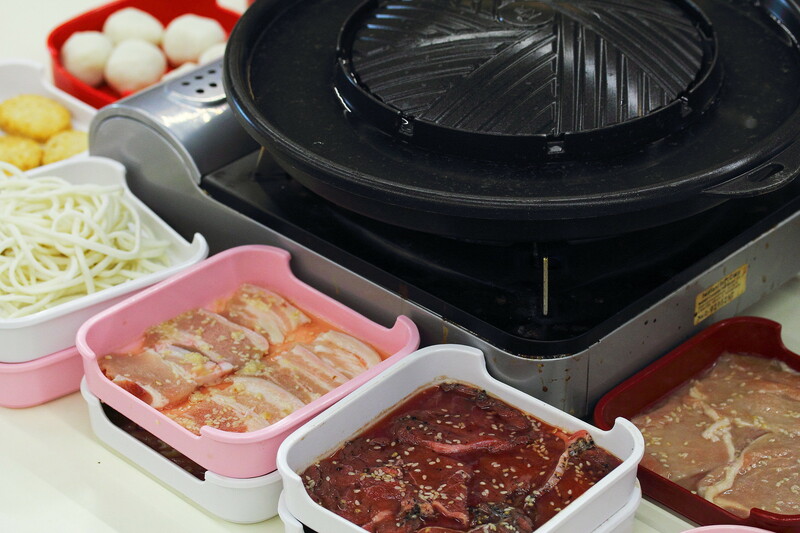 Together with the folks at BITES we headed down to Siam Square Mookata to check out the affordable Thai style steamboat. Most of the items on the menu only cost $1.80 per plate while the eat all you can buffet is only $29 per pax. 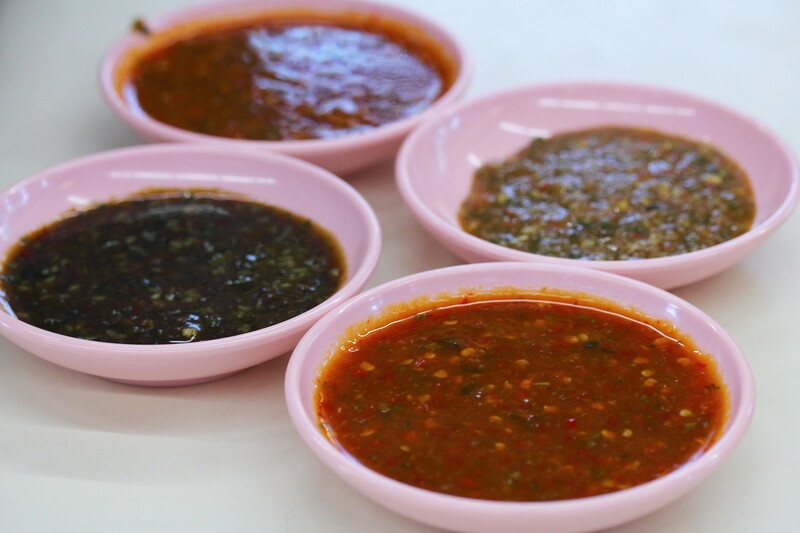 Siam Square Mookata offers three types of chilli sauce dips for the Thai style steamboat. The dark coloured sauce is sweeter which is suitable for children. The green Thai chilli sauce is a bit spicier with a hint of sourness. However the star is the red coloured chilli sauce, this is da bomb and it packed a punch. It goes very well with most of the ingredients. Unlike many mookata places the skillet pot is non-stick. 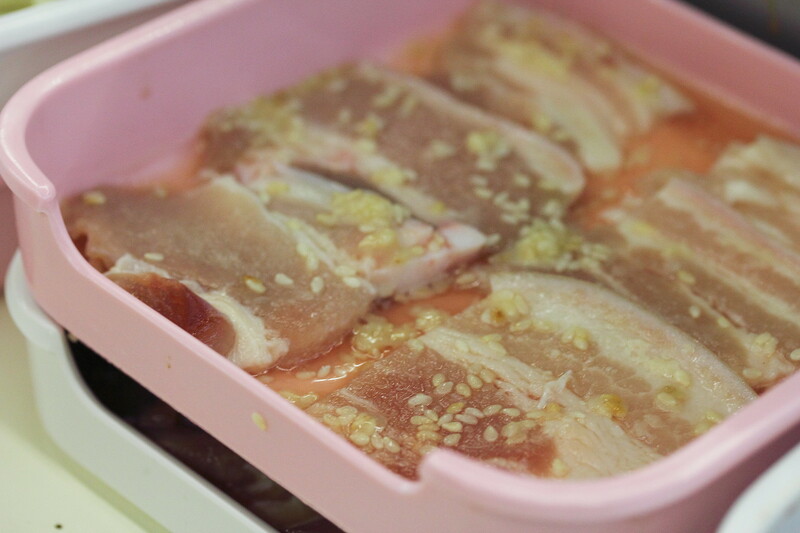 Hence there is no need to use pork lard to grease the surface before bbq the ingredients. 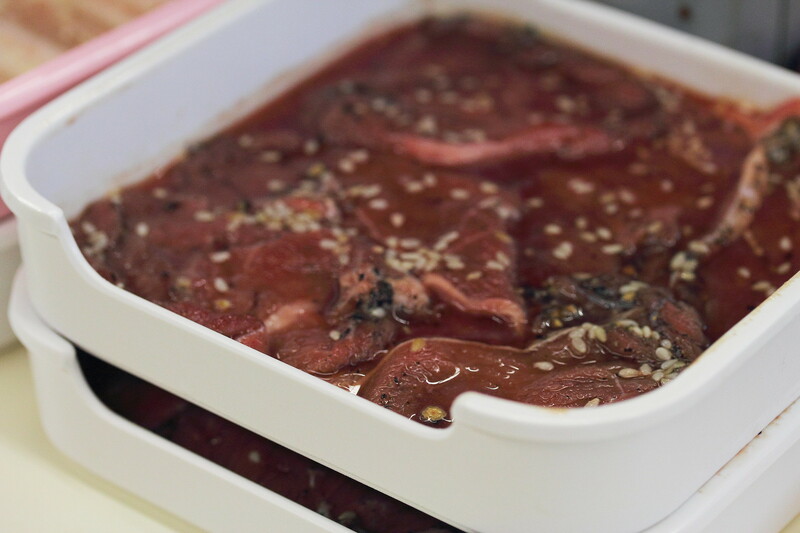 The ingredients are served in stackable trays or plates which is actually quite tidy and neat. Two interesting ingredients among the extensive selection caught my eyes which is Fuzhou Fishball and Fish Paste Noodles. I am actually quite surprises to see Fuzhou fishball in the menu as it is not part of Thai cuisine. 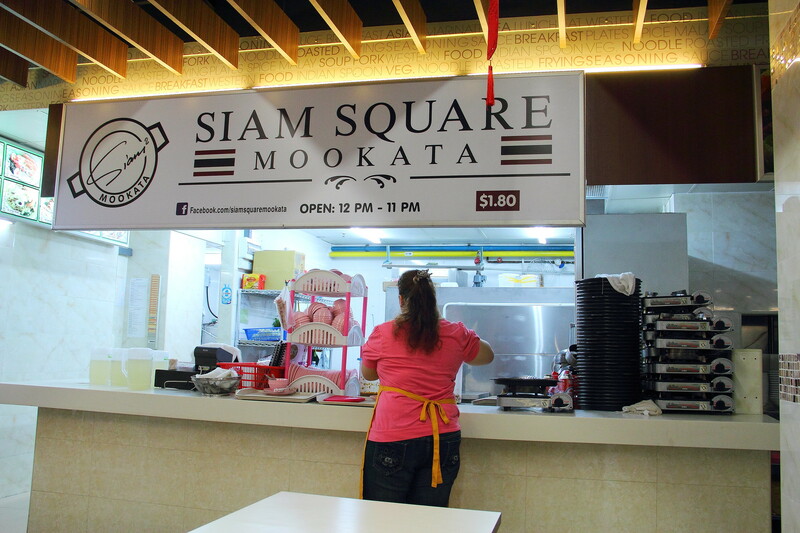 This shows the wide selections of ingredients you can get at Siam Square Mookata. 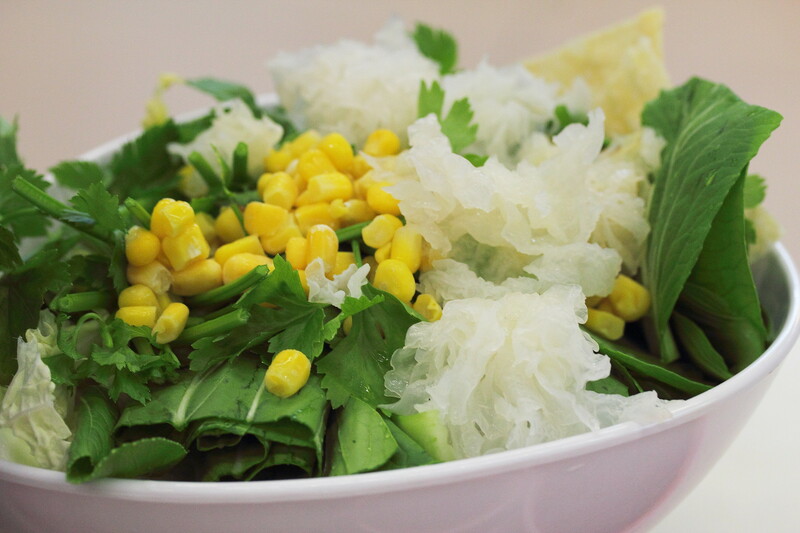 A must try item here is the Fish Paste Noodles. It has a very interesting and springy textures that comes with a very enjoyable bite to it. While I find the meat too thinly sliced but I like the marination. The Black Pepper Beef stood out for me for its peppery kick. Not all items on the menu are priced at $1.80 per plate. Some premium items such as the oysters, squids, prawns, smoked duck, scallops etc are priced at $2.80 per plate, a dollar more. Even so, I think it is still quite reasonable and affordable. Overall I have enjoyed my meal at Siam Square Mookata. I like the extensive selection of ingredients available on the menu, even stuff such as Fuzhou fishball, fish paste noodles etc. Lastly the star at Siam Square Mookata has to be their power chilli sauce. It damn shiok. Cool interview! Never seen Fuzhou fishball in a Mookata before! Hahaha yes my comfort food..I crave for laksa whether I am back in SG too. Is there a time limit to the buffet ? Which is the best mookta buffet you ever ate ?